Jeffrey Welch's Blog: We’re Wagging About These Holiday Dog Products, and You Can Enter to Win Them! Editor’s note: Have you seen the new Dogster print magazine in stores? Or in the waiting room of your vet’s office? This article appeared in our December-January issue. Subscribe to Dogster and get the bimonthly magazine delivered to your home. It just won’t seem like the holidays until your dog warms up in the latest winter sweaters and coats. Dogs deserve to eat yummy food for the holidays, too. 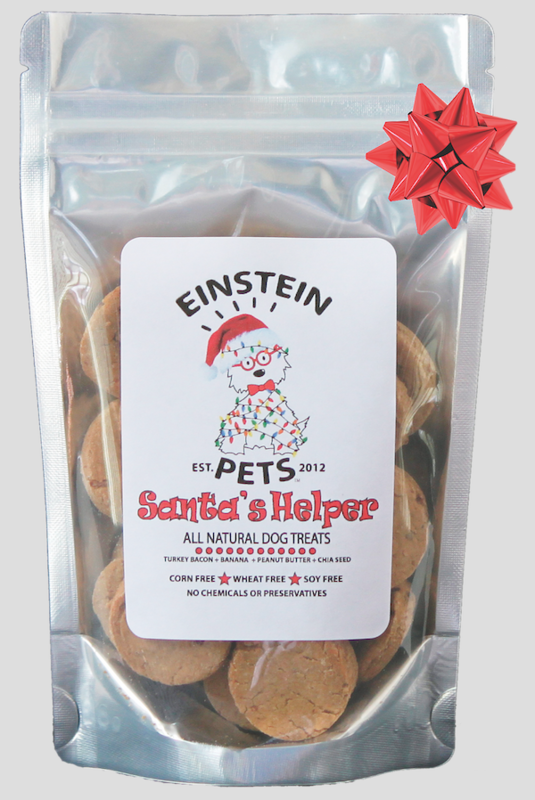 Santa’s Helper all-natural dog biscuits contain turkey, sweet potatoes, honey, and more. Comes in a holiday pack and 2- and 5-ounce bags. Giveaways: two 2-ounce bags and two 5-ounce bags! 2 ounces: $5.95 and up. 5 ounces: $11.95 and up. Gift pack: $14.95 and up. Einstein Pets. Give your dog great gifts this holiday season, like the Santa’s Little Squeakers and Hanukkah toy sets from P.L.A.Y. You can use the toys as ornaments or stocking stuffers before giving them to your pup. 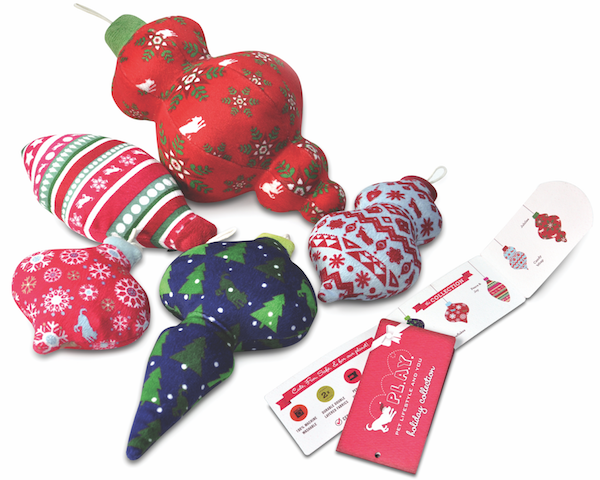 Giveaway: one Santa’s Little Squeakers! Christmas set: $37.90. 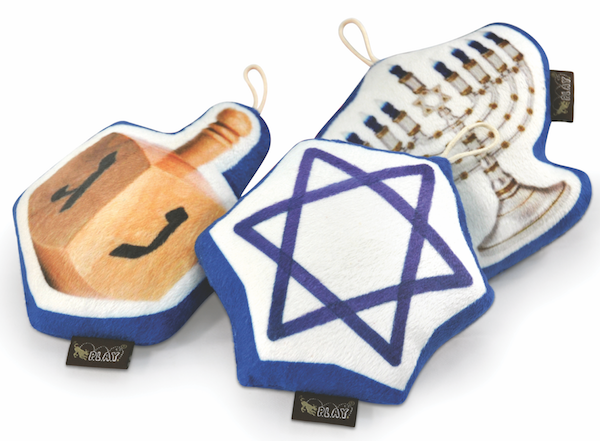 Hanukkah set: $15.90.Get 20 percent off with code DOGSTER20. P.L.A.Y. Custom pet pillows make great holiday gifts! The decorative pillows come with a portrait of your pet’s face. You can upload a photo of your dog on the website and choose between a gray or beige pillow slip. See the website for more information on how to create your pillow. Giveaways: two pillows (U.S. only, except Alaska and Hawaii)! $135. Get 10 percent off with code Dogster. Cristions LLC. Get your pooch in the holiday spirit with these adorable collars, with designs like Poinsettia, Under the Tree, and Arctic Penguin. Collars come in S, M, and L sizes. $17 to $21. Very Vintage Designs. 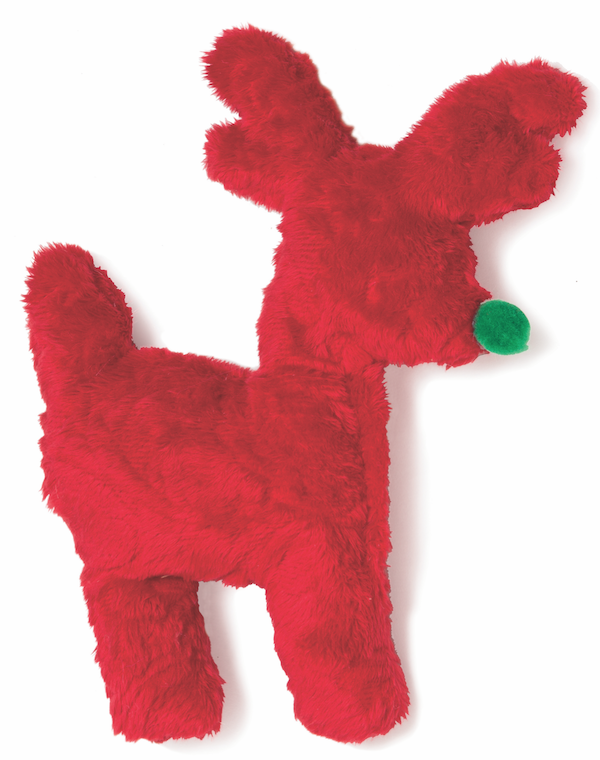 Your dog can dance, prance, and dash with the Tiny Tuff reindeer. The fabric toys contain recycled fiber and a sewn-in squeaker for extra fun. Available in embossed red and green. Giveaways: three reindeer (choose color)! 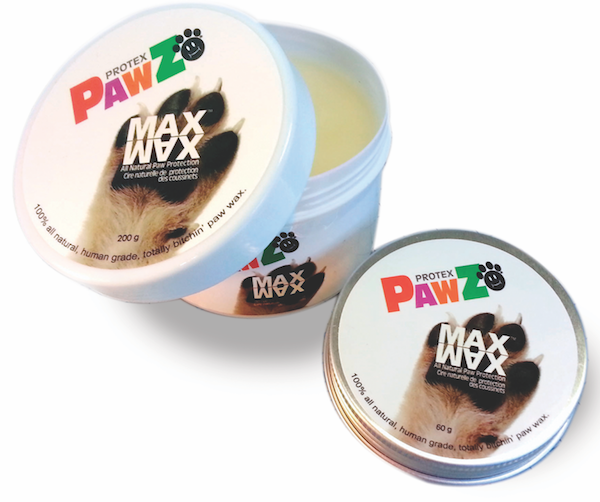 If your dog loves playing in the snow, try Pawz Max Wax paw wax. It protects your dog’s paws from snow and ice buildup and chemical burns from ice melt and salt. $11.95 (60-gram tin). $19.95 (200-gram jar). Pawz Dog Boots, LLC. Go to dogster.com/freebies to see how to enter and for Contest rules. One prize per person per Contest. NO PURCHASE NECESSARY TO ENTER. Contests are open to legal residents of the 50 United States or District of Columbia, age 21 or older. Entries must be received between 12:00:01 a.m. PST on 10/6/16 and 11:59:59 p.m. PST on 12/31/16. Void where prohibited by law. Sponsor: Lumina Media, LLC. The post We’re Wagging About These Holiday Dog Products, and You Can Enter to Win Them! appeared first on Dogster.